Adapted from the Aws tutorial - Building a Modern app (module 5). 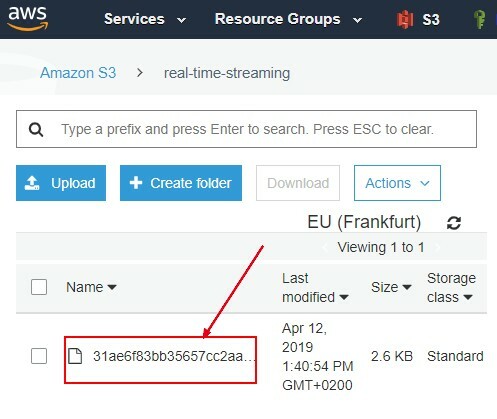 Click Event records will be processed in real-time by a serverless code function, aggregated, and stored for any future analysis that you may want to perform. :: A CFN template for creating the full stack. pip install requests -t .
Replace REPLACE_ME_API_ENDPOINT in the Lambda Function Code streamProcessor.py by the ApiEndpoint of the Mysfits service API (this is the same service ApiEndpoint that you created for the website frontend). git commit -m "New stream processing service." Successfully packaged artifacts and wrote output template to file .\cfn\transformed-streaming.yml. Returned by the SAM CLI command is the CloudFormation command needed to be executed to create our new full stack. But because our stack creates IAM resources, you'll need to add one additional parameter to the command. Once this stack creation is complete, the full real-time processing microservice will be created.